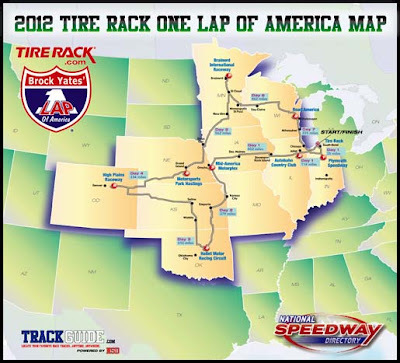 Last year, Leh Keen, Doug Wilks, and the team from TopSpeed Motorsports won the 2011 One Lap of America. Clearing the field by 30 seconds at some tracks, they truely dominated the event. However, if you let good enough sit, someone else will overtake you. 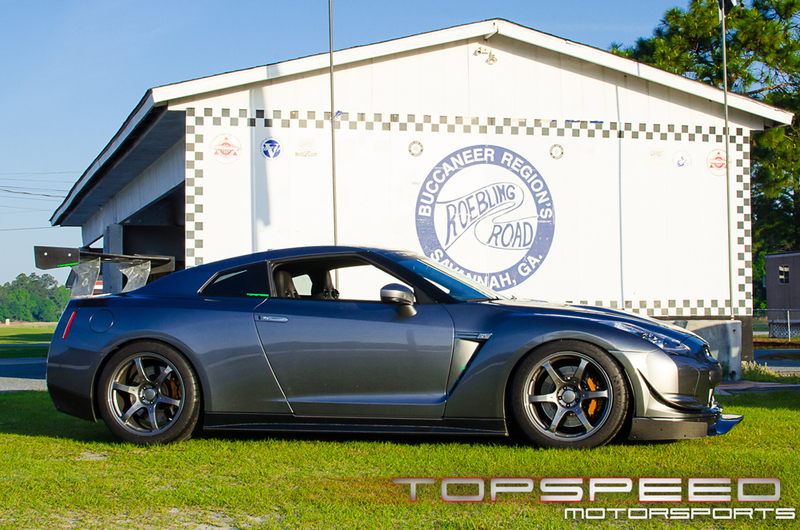 So this year TopSpeed Motorsports, along with several other Nissan GT-R's are preparing for the event. Happy to be involved with the guys, and doing my best to support them. T|S|M is very excited about our One Lap of America program this year and would like to once again share it with the community. In 2012 we will again be campaigning our 2010 Nissan GT-R, driven by none other then our "ALL-STAR" setup team of Doug Wilks and Leh Keen. In 2011 the T|S|M GTR ran very well clenching the Overall Victory early with a day to spare. Even still after last years win the team here knew we still had some time left on table so we got to work. They are making a number of changes to the setup, from the turbos, to intercooler piping, inlet piping, oil cooler, transmission upgrades, suspension, and aero changes.So far it seems like its working. Not wanting to leave any stone unturned our next stop was aero and chassis! Last year we ran on stock shocks with KW Sleeves with Stillen sways that performed flawlessly. This year we knew the chassis was going to need some more support. Given our winning track record and ability to provide feedback with pro driver Leh Keen, JRZ teamed up with us and supplied a custom valved set of RS Pros for the event. The JRZ RSpro's along with Stillen sways gave us everything we were looking for and the adjustment to make quick changes for different tracks. Last year their setup was good enough for a 1:14.7 lap time at Roebling Road, this year with the changes they have run a 1:13.4 picking up over a second. Click though for the video. 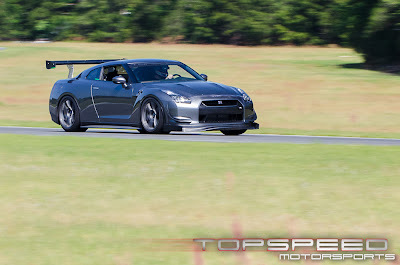 The first setup test was April 10th, 2012 at Roebling Road Raceway in Savannah… we tested there last year so we already had a baseline for the car with a lap time of 1:14.70. After just a few laps in the morning it was clear that the upgrades were not in vain. The car performed very well, besting last year's fastest lap by well over a second on the same tires and running a 1:13.40 lap time!! They are testing the car, improving the areas they see deficiencies. They run a lot of tire (315) in a square setup. Square as in the same size front and rear wheel, and tire. Square can also mean the same size tire on a differing size rim. This opens up a lot of possibilities. The wheels are Volk G2s 11.5x20 Square w/ +15 offset. They are matched with a set of wider carbon front fenders to allow the front to work. The tires are Michelin Pilot Super Sports 315/35/20. You are required to use a full street tire in OneLap with a 160 or greater TW rating....the PSS is an amazing tire that works great with the GT-R. I also want to thank the companies that have come behind us with sponsorship support. Video from Roebling Road. They will be live streaming from the event. They look pretty good for another overall. 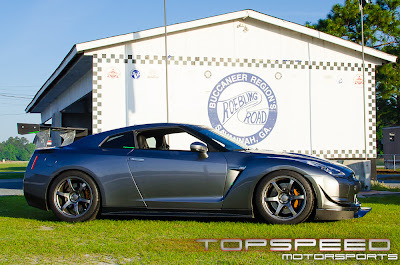 Lots of GT-R's entered this year, they seem to be the car of choice for the SSGT1 Big Bore class.